Montenegro's President Filip Vujanovic has won a third five-year mandate, the electoral commission announced Monday after a bitter poll that saw his sole challenger cry foul over alleged fraud. Vujanovic won 51.21 percent of the votes compared with Miodrag Lekic's 48.79 percent, commission's chairman Ivan Kalezic told reporters. Both candidates had claimed victory in the election for the largely ceremonial presidential post. 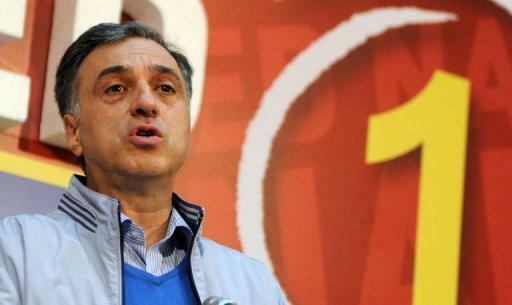 Lekic, who has managed to get Montenegro's main opposition groups to overcome their bickering and back his candidacy, cited "indications of fraud" and urged Vujanovic to "be serious and responsible". But the commission said no major irregularities were reported during the election day, adding that turnout was 63.9 percent of some 511,000 registered voters. And Europe's top security grouping the Organisation for Security and Cooperation in Europe said the elections "generally met OSCE commitments". The presidential election was the country's second since it proclaimed independence from Serbia, its decades-long partner, in 2006. But it has been seen as a test for the ruling coalition that has been in power, under the stewardship of Milo Djukanovic, a veteran politician and a close ally of Vujanovic, since the break-up of Yugoslavia in the 1990s. Victory for Lekic could have brought instability to Montenegro, as Djukanovic holds the powerful post of prime minister, while his Democratic Party of Socialists coalition has a majority in the parliament. The opposition has repeatedly accused Djukanovic and his allies of corruption and political and economic monopoly. Djukanovic, an architect of Montenegro's independence, has himself been accused of corruption but has denounced the claims as "lies". In 2006 he was named a suspect in an Italian probe into cigarette smuggling and people trafficking during the Balkan wars in the 1990s. But in May 2009 an Italian court dropped the charges against him. Experts say that corruption is deeply rooted in the country of 632,000 people struggling with an unemployment rate of 20 percent, and where the average monthly salary is about 480 euros ($615). Brussels opened EU accession talks with Montenegro in June, but the European Commission noted that Podgorica should do more to uphold the rule of law and crack down on organised crime and corruption. Montenegrin incumbent President Filip Vujanovic addresses his supporters in Podgorica on late April 7, 2013. Vujanovic has won a third five-year mandate, the electoral commission announced Monday after a bitter poll that saw his sole challenger cry foul over alleged fraud.